In 1892, Ruby Summers (Grable) is the queen of burlesque with her rousing songs, outlandish costumes and shaking of hips. The owner of her dance hall, Mike Stanley (Harris) has cheated Andy Clark (Mature) out of his half ofthe business, and Andy is set to get even. Andy works to ruin Mike’s business and make Ruby into a lady while also making her fall for him. -Remake of Betty Grable film, “Coney island” (1943), which co-starred George Montgomery and Cesar Romero. While I don’t actually think this is the case, “Wabash Avenue” is very similar and nearly is a scene-by-scene remake. I’m not sure why 20th Century Fox decided to remake the same film with the same lead actress, but it’s almost a little off putting. 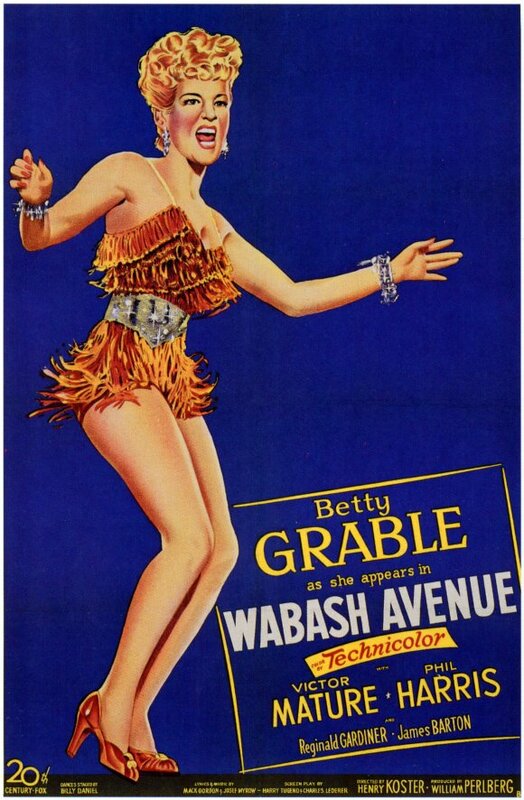 However, in any film with Betty Grable, it’s difficult not to be drawn to her energetic delivery of a song and dance and “Wabash Avenue” is no exception. 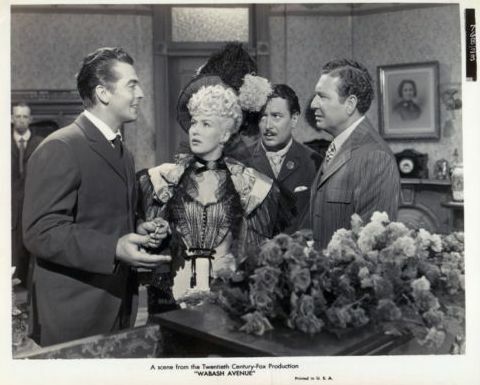 In this film, Grable’s Technicolor costumes and songs are fantastic and entertaining. I of course still enjoyed this film, because I also liked “Coney Island,” but of the two, I prefer “Coney Island” due to the superior male co-stars of Cesar Romero and George Montgomery. It’s hard to believe that Betty Grable would have anything romantic with Phil Harris-also if you have knowledge of Grable’s friendship with his wife Alice Faye. Though Victor Mature is believable for a grifting cad. This entry was posted in Musical Monday and tagged Betty Grable, Musical Monday, remake, Wabash Avenue by Jnpickens. Bookmark the permalink.